Created 2011, hand-lettered on Halloween night. This is a free font, and I mean FREE. Use it however you want, for whatever you want. If you make something cool with it, I'd love to see it - email me at savage@sinistervisions.com and tell me about it. If you offer it for download on your own font site, PLEASE include this Read Me. That's not too much to ask, is it? This font is intended for specialty and graphic uses. It will look just awful if used in a paragraph format. The upper and lower cases of Needleteeth Psycho and Needleteeth Spooky alternate sizes - mix and match the cases to GeT tHaT sTaGgErEd LoOk. For more free fonts and other downloadable goodies, visit http://www.sinisterfonts.com. 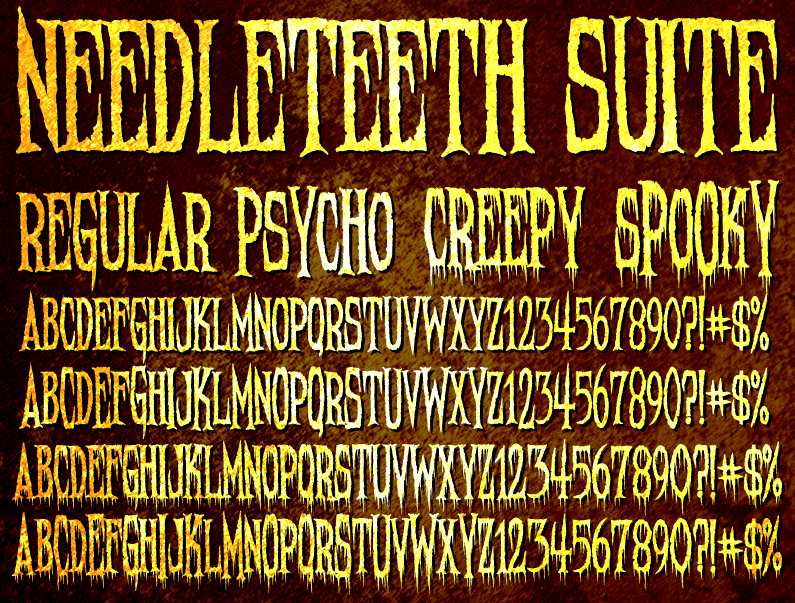 FOR INSTRUCTIONS ON HOW TO INSTALL/USE THIS FONT, visit http://www.sinisterfonts.com, or just look it up on Google. Seriously. Don't email me and ask - this information is easily found with a 20-second search.